The DigiCore DCA700 family of products puts you in touch with your staff, no matter where they are! Our DCA710 uses any 3G network to provide you with 2-way communication combined with live tracking. The unit has the ability to provide a “dot on the map” every few minutes, but it can also be polled to provide instantaneous information on where the worker is. This feature can be an essential life saver on a dangerous mine site. By making use of geofencing you will immediately know if a worker has entered a restricted zone and this can be done via SMS and/or e-mail, from where the site manager would be able to sign onto a live system to monitor the situation. Following this the worker can be called directly and instructed to vacate. Mine sites often don’t allow workers to carry mobile phones with them but this product poses no risk of distraction: it can make calls, but only to pre-defined emergency numbers. The tracker’s mobile number can be kept confidential so nobody other than site supervisors would be able to call the worker. 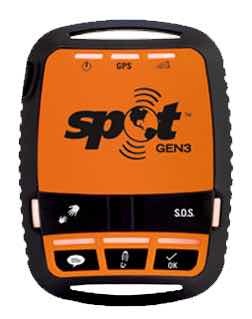 The DCA720 is the highly acclaimed SPOT3 satellite tracker. The unit can be programmed to relay positions back every few minutes and it also provide the worker with duress notification capabilities – the simple press of a button will send the duress and the worker’s position back to an online system. Commercial – We will now not only provide you information on driver behaviour, but also on staff movement. We can tell you when people show up at work and how long they stay on site and show you how they move around as and when they do so. We can, for instance, feed data directly into your payment system from where you would have the ability to pay people for exactly the time they spent on site. Safety – Site management now have the ability to communicate directly with individual workers, without having to allow staff to carry personal mobile phones on them. Our customers are now able to evacuate an entire site with a simple click, or to have a system send a warning message to somebody entering a zone where they are not allowed. All of this is easily done through geofencing and all we’d need would be accurate maps for your site. This can be fully automated to the point where a computer will monitor site movement every minute of every day and, in the event that there is a violation, the worker will be sent an automated message and the violation can be recorded for follow-up. Contact us today to discuss the many opportunities this will open for your site.